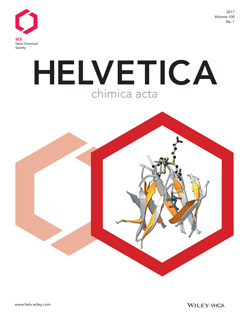 Helvetica Chimica Acta, founded in 1917 by the Swiss Chemical Society, is a monthly multidisciplinary and international journal dedicated to the dissemination of knowledge in all disciplines of chemistry (organic, inorganic, physical, technical, theoretical, and analytical chemistry) as well as research at the interface with other sciences, where molecular aspects are key to the findings. Helvetica Chimica Acta is committed to publication of original, high-level full papers at the frontier of scientific research. All contributions will be peer-reviewed with the highest possible standards and published at acceptance. Send mail to webmaster@helvchimacta.ch with questions or comments about this web site.